One green driving detail that has fallen somewhat into the background as the hype train chugs its wailing way into Chevy Bolt Station is that General Motors is not just working on battery electric vehicles—for some time now, it has been developing hydrogen fuel-cell vehicles, most recently in partnership with Honda to defray research and development costs. This technology has taken a few forms: first, you have the company’s fleet of fuel cell Equinoxes, which in May of 2014 passed 3 million miles of real-world driving and then GM and the US Navy teamed up to create fuel-cell-powered unmanned undersea vehicles, or UUVs. The only official names we had for GM’s fuel cell efforts were “Equinox Fuel Cell,” and “Hydralogic,” which was the subject of a GM trademark application from 2014. 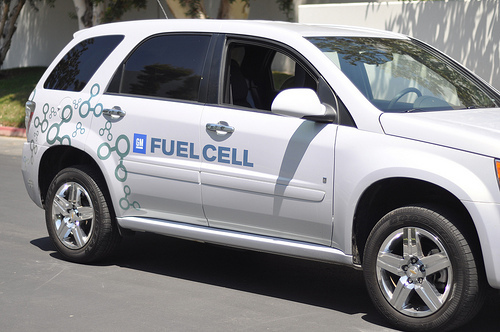 However, thanks to another trademark application uncovered by GM Authority, we may now know a more finalized name for the company’s fuel cell vehicle efforts: Hydrotec. This would follow the naming convention that the company already applies to its Ecotec engines. The applications, numbered 87192677 and 87192753, specify that the name Hydrotec will apply to goods and services associated with vehicle fuel cells, and will take the shape of the word in all capital letters, with a hexagonal design around a water droplet taking the place of the O. This is almost certainly because hydrogen is hexagonal in crystal form, and the hydrogen fuel cell vehicle propulsion process produces water.